Remove the skin from the butternut squash using a sharp knife cutting into small cubes. Finely cut up a clove of garlic and add to the butternut squash cubes. Pour some olive oil onto an oven tray and place in a hot oven. Once hot add the butternut squash cubes and garlic and coat them with the hot olive oil. Place back into the oven keeping the oven on about 200 degrees centigrade. After about 10 minutes remove the butternut squash from the oven and add a dollop of Must Chup ‘Big Kick’. 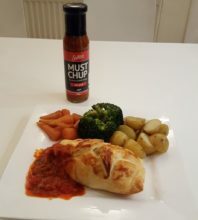 The quantity of Must Chup will be based on your heat preference. Mix the Must Chup in with the butternut squash and garlic and place back in the oven for another 10 minutes. Then remove from the oven and allow to cool. Cut up half an onion into dice and place in a hot sauce pan with olive oil. Reduce the heat after a few minutes and continue sweating off the onions adding a little balsamic vinegar. Once soft and caramelised remove from the heat and add to the butternut squash. Cut up the feta cheese into small cubes. Remove puff pastry from box, cut into two and roll out a little thinner to suit making a Wellington parcel. Add the butternut squash, caramelised onion filling and feta cheese to the centre of the pastry square. Egg wash the edges of the pastry and folder over to make a parcel. With the spare pastry you can cut out some leaves and decorate the parcel. Brush the parcel top and leaves with egg wash.
Place in the middle of the oven at a temperature of 190 degrees centigrade for 15 minutes or until the parcels are nicely browned. Also add the pumpkin seeds into the oven until they start popping! These are used to garnish the dish and add a nice crunchy texture. Pour the ready-made tomato and basil sauce in a pan and heat. You can of course make your own if you wish. Add some shredded fresh basil to enhance the sauce and serve.